Our 3rd event was held at Elbow Springs Golf Club and it was another beautiful venue! We kicked off the evening with some music and dancing during registration. Thanks Jesse Hare from Truline Productions, the kids loved grooving to the music! We loved the extra smiles the music brought out. We were fortunate to have Heidi Smethurst join us from Heart Beats Society. Heidi sent out a heartfelt thank you to all the kid members for their donation of $800 the last time we met! She explained that there are approximately 130 families each year that have to travel to Edmonton for their cardiac surgeries at the Stollery Hospital. This is costly for families as the average stay is about 2 weeks. Heart Beats uses the donation money to provide financial assistance for these families in the form of gas and grocery gift cards. Thanks to Heidi for coming to share with us. We wanted to share with the kids how much of a difference they are actually making! When we started this group in early 2016 there were only 5 kids chapters throughout Canada and there are now 17, WOW! If you make the assumptions that they are all at full membership (100 kids) and that they meet 4x per year each member giving $10. With 17 chapters, following those assumptions, the impact for each quarter is $17,000 (17 chapters x 100 kids x $10), and each year $68,000 ($17,000 x 4 meetings). That is the potential IMPACT of the kids’ chapters in Canada right now. This proves our motto that “We’re Strongest Together,” which we were able to proudly display on our new 100 Kids Banner that Shannon Hewlko designed for us! 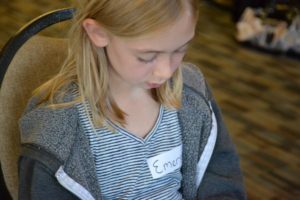 Emerson is 9 years old and it was evident that she is passionate about animals and specifically dogs. Fur-ever Homes believes that every dog deserves a second chance and they rescue local dogs as well as those from Mexico and LA. They are always looking for foster homes to love these dogs until they are adoptable and Emerson has been a foster home to many of these dogs and loves it. 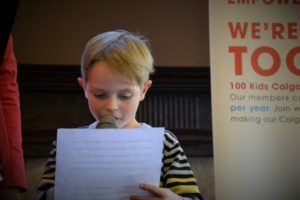 Tristan is 7 years old and he spoke from the heart about Brown Bagging for Calgary’s Kids. He shared with us that he couldn’t imagine having to go to school without a lunch and felt sad knowing that some kids in Calgary do. 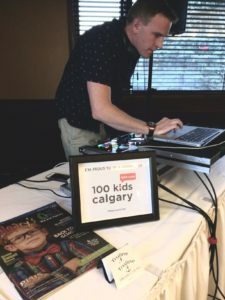 He asked the kids to join him in making a difference by choosing BB4CK’s so that they can help them reach their goal of NO hungry kids in Calgary. They currently provide over 3000 lunches everyday to kids in this city. Kian is 10 ears old and currently volunteers with the Calgary Seniors Resource Society. Their goal is to support seniors so they can stay in their homes as long as possible and feel like valued members of society. They help them to deal with the loneliness a lot of them face when they have no family around. Adopt a Grandparent is one of their programs where you can bring some joy into the Seniors’ lives by spending some time with them, sending them letters/cards, and helping them do things around their house. 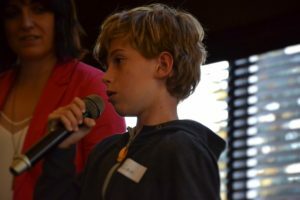 After the three speakers the kids took out their voting ballots to make their decision. There is something truly special about watching the kids grab their own voting ballots and crayons and proudly making their choice on which charity should win the group donation. While we tallied up the votes we did some door prizes for the kids…this time we had 6 – $10 Subway gift cards. We love to see the excitement when a child wins a prize, they are always so thankful! 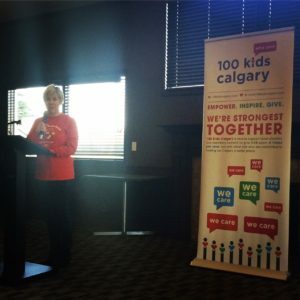 Just before we announced the winner we had a special SURPRISE to share with the kids…a great group of Rodan + Fields entrepreneurs that Danielle works with decided they wanted to give back and they chose to support 100 Kids Who Care Calgary! At their last event the ladies were able to raise $800 to give to the kid members for their charity of choice at the next meeting. This announcement definitely created some excitement and wide eyes in the crowd! 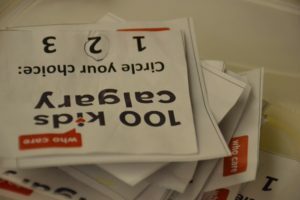 The votes were tallied and the winning charity was Brown Bagging for Calgary’s Kids, thanks Tristan for your nomination. The kids raised $405 themselves that evening which will be added to the extra $800 donation, making the current total $1205! If any of you would still like to contribute please send us an email at info@100kidscalgary.com and we will make arrangements for that. Every little bit helps and it is your donations that truly make the difference. We so appreciate the donations from all members including those that couldn’t be there with us but sent money with family or friends. THANK YOU to our official sponsors…Calgary’s Child Magazine as well as Redline Real Estate Group and MortgageLine. These sponsorships are the key to our success! Mark your calendars for our next event Wednesday, December 7 at Valley Ridge Golf Course, we hope to see you all there! Stay tuned to here what FUN we have planned for this event.